After months and months (going on a year, no joke) of sitting in all its old, floral-cushioned glory, I finally decided to do something about that chair I (sort of) risked my life to buy. I have a reaaally small master bedroom. 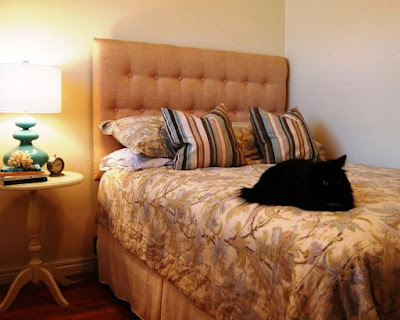 No room for a cute seating area or even a bench at the foot of the bed. I chose not to have a dresser in the room in order to create a bit more room for cuteness (my husband was not a fan of this decision -- cuteness is not as high a priority for him apparently) so when I saw this chair I knew it would be a perfect fit for the itty bitty space. I removed the gross floral fabric and the nasty old foam cushion that had hardened and then disintegrated over the years. 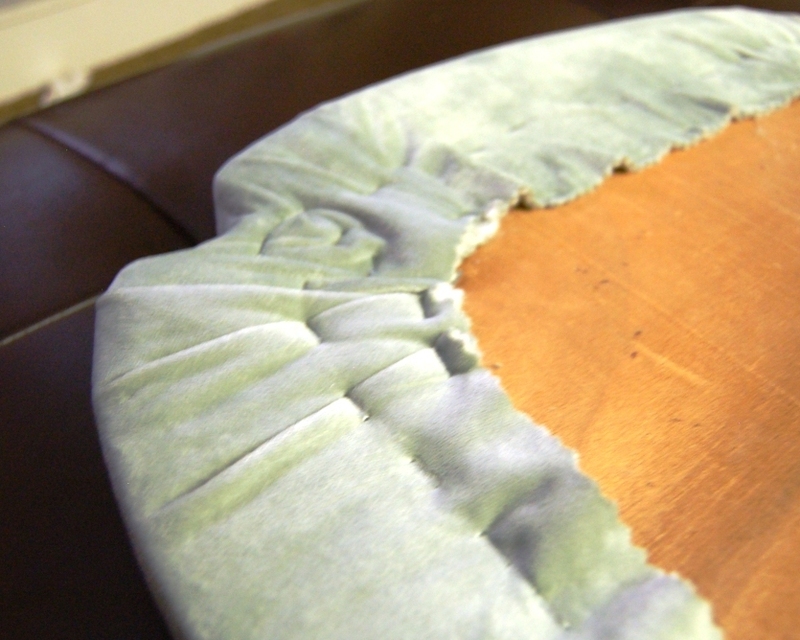 It took a bit of work to remove all the glue and petrified foam residue, but I really wanted to re-use the original wooden seat since it had specific little nooks and crannies cut out of it to to fit around the arms of the chair. And I? Was not about to get all crazy with a jigsaw to finish this project. I saved some money by finding a little piece of velvety fabric on the remnant table at a fabric store. Then I put the kiddos to bed, turned on a period romance movie, poured myself some red wine and a little snackable-sized bowl of chocolate chips, grabbed a staple gun and had myself a wild time. Wow. Don't look too close, k? I really have no idea what I'm doing when it comes to this (or really, most anything). See the little pleats on the rounded corners? Aww. They're so cute. 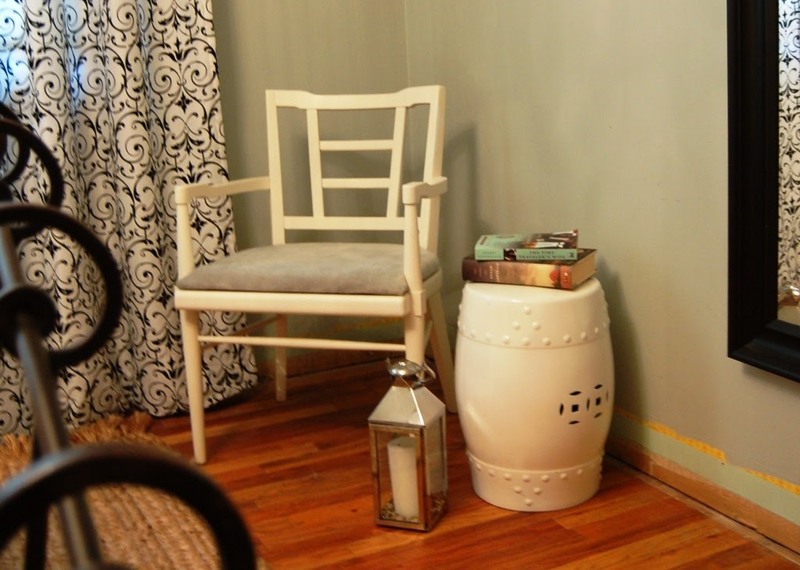 I also painted the chair with Rustoleum's Heirloom White spray paint. I know, eeeeverybody and their dog (or blog?) loves that color. So here I am jumping on the bandwagon -- it's a good color, people! It's a really nice and creamy white. No pictures of that step though, 'cause I like to keep you guessing. and Blue Cricket Design... go take a look! Adorable! See why I trusted you to de-Hundred-Aker-Woods my guest room? 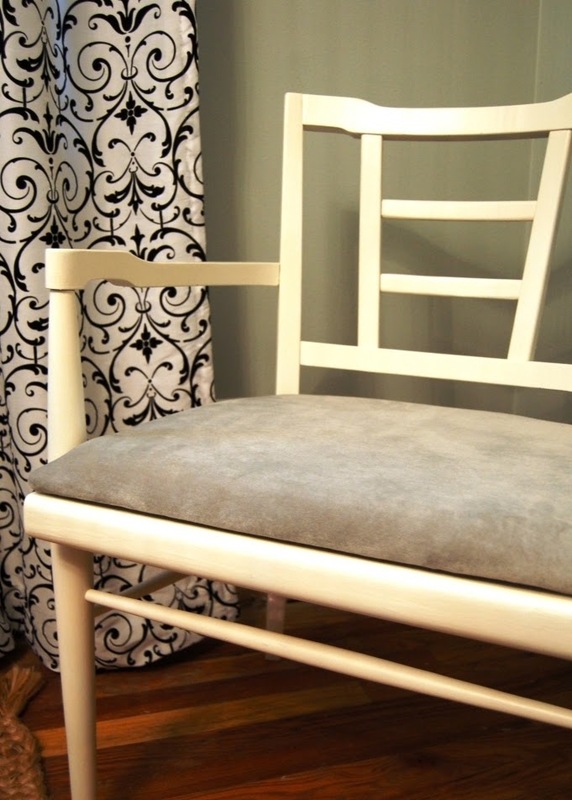 I love the lines of that chair now that it is painted and new upholstery. Great job Anna. wORTH RISKING YOUR LIFE IN THE CELLAR OF A FARM HOUSE IN THE MIDDLE OF NO WHERE....i AM CERTAIN. I do like the look for you new chair, not even any blood on it. Much cuter now! Great job! That chair is awesome. Looks great. 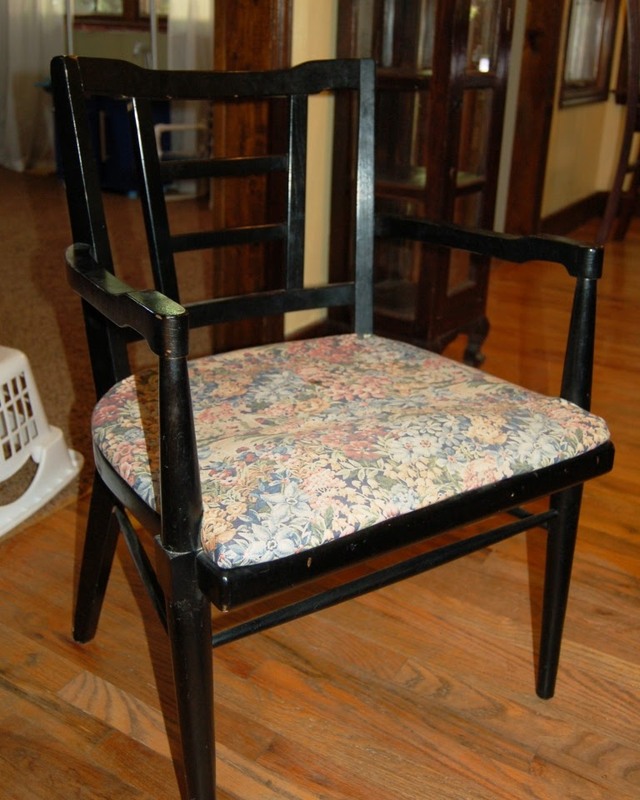 Oh my gosh I have an entire dining set that we inherited that totally reminds me of your chair! Its this green from the 60s or 70s and Ive been very close to listing everything on Craigs b/c I hate its current state so much. I may paint the chairs and refinish the table thanks to your post! i hopped over from remodelaholic to tell you how beautiful your chair is. i love the modern lines and nice clean look. Cuteness achieved I think! 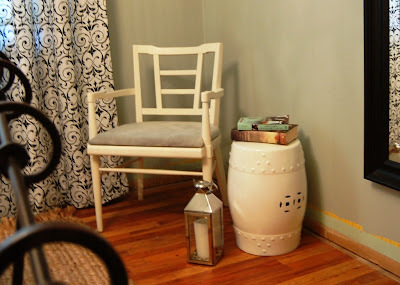 Just pretend the lack of baseboards is like an extra kinda rustic detail. Right? Sure! That's what I say! Looks awesome! I love the fabric you chose too! What a great before and after! It looks totally cute!